This past week, I decided to put together a vision board to hang in the creativity nook of my home office. I wanted something that I could look at everyday that offered a boost of motivation, and this project fit the bill perfectly. On the board, I hung pictures and quotations that offer inspiration, bring joy, and spark creativity. Now, I love quotations. 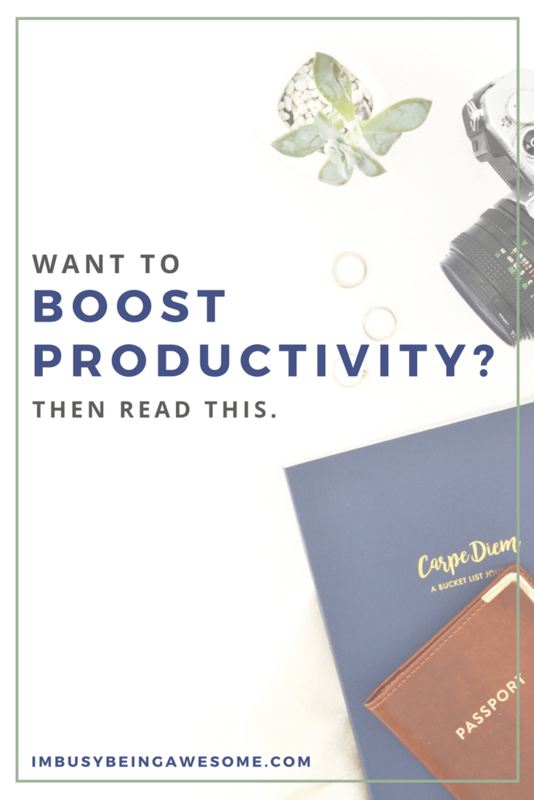 There’s just something about them that can boost my mood, shift my perspective, and give me the nudge I need to continue working toward my goals. 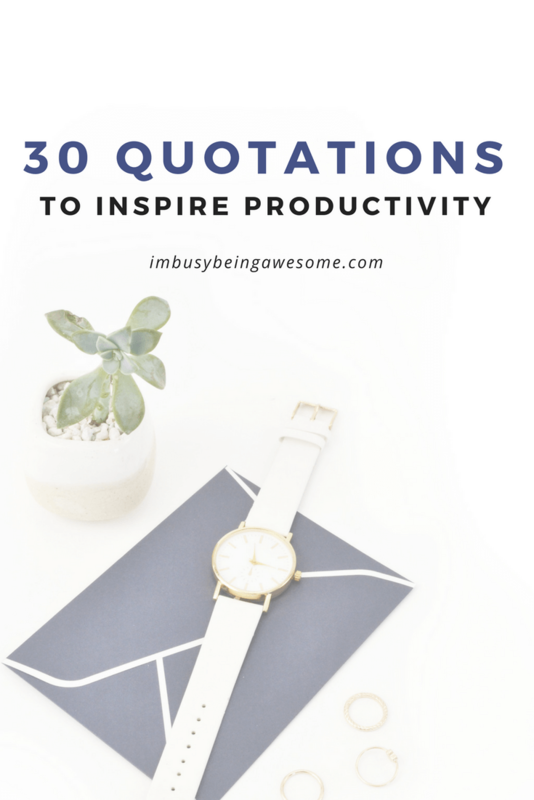 So as I searched for productivity quotes for my vision board, I decided to copy each one that spoke to me in a document on my computer. And let me tell you. That list got long. After taking some time to read through my collection, I started thinking about you wonderful readers. Inspired, I decided to create a series that shares these quotations over the next few weeks, so that you can enjoy the words of wisdom as well. So if you need a motivational boost today, read on. I guarantee you’ll find at least one quote that speaks directly to you. It’s so easy for us to get swept up in the hustle and bustle of daily life. We get distracted by an overflowing inbox, social media comparisons, and all the “extras” that seem to fill our time. Covey’s statement – as simple as it is – highlights the importance of knowing your priorities, keeping them at the center of your mind, and not getting distracted by the excess. Instant gratification is such an alluring promise, isn’t it? It feels great to work on a task that – within the day – receives immediate feedback. And you know what? There’s absolutely nothing wrong with this type of activity. Take baking, for example. You bake a cake, frost it, and then enjoy it with your family that night for dinner. Smiles all around. And again, it’s important to keep that up. We need to feel a sense of accomplishment and contentment each day. That’s what keeps us going! The problem arises when what you think you want, takes up the time meant for what you really want. So keep what you really want at the forefront of your mind. Set your priorities, and don’t get distracted by the rest. Of course, Warren Buffet is the guru of all things money. But this wise statement is applicable to so many areas of our life. Those who are successful today planned ahead. They got their priorities straight, they knew what they wanted in life, and they did what they had to do to reach their ultimate goal. The key is to not prioritize what’s on your schedule, but to schedule your priorities. I found this quote especially inspiring, because it speaks to my love of time blocking. Essentially, Covey reminds us not to look at our daily todo list as we figure out our schedule. Rather, we should look at our list of priorities, schedule them first, and then deal with the daily details after. Admittedly, this is a big shift in perspective for many of us, but it’s really a game changer in terms of reaching our goals when we start putting our priorities first. This is a tough one for me to swallow. I’m a Type-A Upholder (learn more about what that means here! ), and through hell or high water, I need to finish what I start. As Buffet reminds us, however, sometimes the energy we’re expending to push water up a hill is perhaps not the best use of our time. Maybe we need to reevaluate our priorities; it’s possible we’ve been stuck in our ways for so long that we haven’t stopped to consider alternatives. Perhaps we simply need a break from the project to recharge our battery. So if find yourself figuratively beating your head against the wall while working on a project, frustrated because you’re not moving forward, it might be time to reevaluate your priorities. If you’ve set a priority that’s incredibly important to you, but you’re not quite sure how you’ll get there, don’t let that stop you. Rather, concentrate on the project with all of the energy you have. If the “what” is front and center in your mind, the “how” will come into focus through dedication and hard work. Here’s the deal. It’s easy to push things off until “tomorrow.” And it’s even easier to put off challenging tasks (which are often our biggest priorities) in hopes of waiting for the “perfect time” to come along. Tomorrow is always tomorrow, and there will never be a perfect time. So you better get started rocking the life you want now. As Godin suggests, however, you don’t need more time. You just need to stop wasting the time you have deliberating over minor decisions, scrolling through social media, and focusing on the tiny details that – in the long run – probably don’t matter much. And Walt Disney sums up our priorities and time management category with this straight-and-to-the-point reminder. So I’m going to heed his words of wisdom, stop talking, and move on to the next category. Looking for some time management strategies? Check out my post, The #1 Time Management Strategy: Time Blocking. Then, download my free time blocking template here! Ah, Elizabeth Gilbert, how wise you are. While it’s great to dream big and contemplate reaching your goals, you can’t simply stop there. As Disney reminded us above, stop talking and begin doing. You need to muster up your courage, take a deep breath, and just dive in. Will it be scary? Yep. Might it be <gasp> imperfect? Yep. But diving in is the only way you’ll ever reach those dreams. So to borrow the famous Nike quote: just do it. 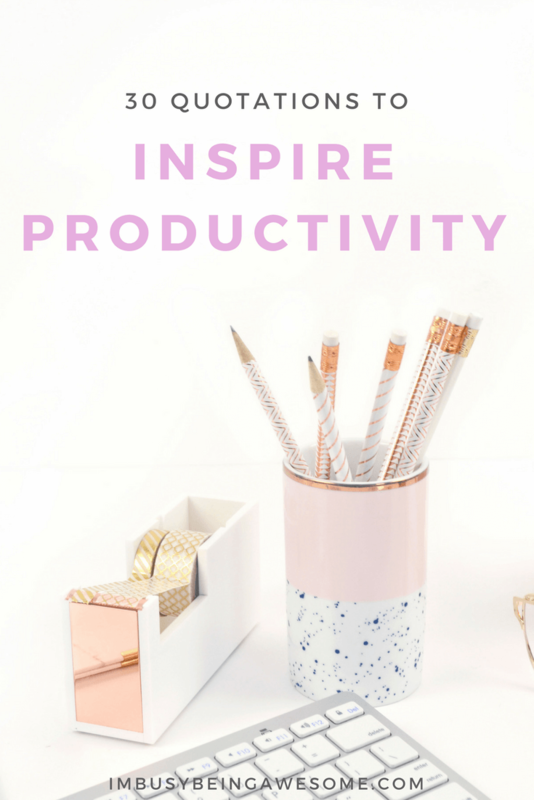 Have you ever noticed that when you’re completely passionate about a project, or you’re so entirely absorbed in a task, your determination manages to push you past any bumps in the road? That’s exactly what Ford is talking about here. Keep your head down, your eyes on the goal, and you won’t even see those obstacles trying to distract you from the sidelines. As I mentioned above, sometimes going after our dreams is a bit really scary. We’re afraid of failure, of letting ourselves or others down, of what other people might think, the list goes on and on. But here’s the deal… If you play it safe and stay within the confines of your comfort zone, you will have a difficult time reaching those big goals you’ve set for yourself. So take a deep breath, remember of how incredible you are, and take a leap. You got this. Sometimes when we dive into a new project or chapter in our life, things get really hard. And the immediate gut reaction is RETREAT! Keep going. You’ve already made the leap, and that’s the hardest part. You got this. This is really what it comes down to when you’re facing a challenging task. Take that first step. Then take the next one. And then the next one after that. Keep moving in the right direction, and you’ll get there. For my fellow perfectionists out there, I’m willing to bet that this quotation speaks to you as strongly as it does to me. Here’s the deal – this needs to stop. I challenge you to talk to any successful person whom you admire, and ask them if they’ve made any mistakes along their path to success. I’m willing to bet that they’ll have stories upon stories not only about the mistakes they’ve made, but also the lessons they’ve learned from each one. And as you engage in this conversation, try to focus on the fact that none of those mistakes held them back. In fact, they often used those mistakes as stepping stones. They turned them into positive experiences from which to learn. And they grew even more because of them. If you find yourself struggling with “imposter syndrome,” or you often face that feeling of inferiority, check out my post How to Boost Your Self Confidence. Then, download my list of 40 positive affirmations to help you keep your confidence and motivation up. The magic thing about habits, is that once they’re formed, you don’t have to waste your time thinking about them. Because of this, you can focus all of your mental energy on the bigger tasks at hand. You don’t have to force yourself to brush your teeth every morning, right? And you probably don’t deliberate over whether or not to put on your seat belt each time you get in the car. That’s because these behaviors are habits. Well guess what? You can form good habits around your priorities as well! For example, if it’s your goal to write a book, then make it your habit to write every since day. Five minutes or five hours, it doesn’t matter. Just get in the habit and stick with it. This statement speaks strongly to the idea of habit formation. Just think about all of the times we’ve decided we’ll eat healthier and get to the gym four days a week. And for the first few weeks – maybe even the first month – we have excitement and motivation pushing us toward our goal. But after that motivation wears off, we need something stronger – and that stronger element is our good habits. It’s not what we do once in a while that shapes our lives, but what we do consistently. I’m going to use my fitness analogy here, too, as it really helps drive the point home. Here’s a rhetorical question: is it better for your health to goto the gym once every two weeks for an eight hour session, or to goto the gym eight times in two weeks for 30 minutes each session? And you can apply this idea to anything in your life. It’s the daily habits that make a difference. Our habits make up who we are. It’s as simple as that. If you’re striving for excellence, make sure your habits reflect your definition of success. This is an idea of which I need to remind myself often. I somehow convince myself that if I’m not “constantly busy,” I’m wasting valuable time. As I continue working toward my New Year’s resolution of a healthy work-life balance, however, I’ve discovered that busy does not always equal productive. In fact, excessive busyness often leads to burn out, which is a far cry from productive. So yes, be productive, but allow yourself breaks as well. Actions prove who someone is. Words just prove who they want to be. What you do is who you are. By developing those good habits, and making them daily actions, you’re proving to both yourself and to others what you’re all about. So stop talking, and start doing. There’s a reason the familiar saying “practice makes perfect” is so familiar; it’s 100% true. Don’t let yourself get distracted by “shiny object” syndrome. Avoid bouncing from idea to idea because your first attempt wasn’t perfect. Instead, find your passion, start practicing, and don’t stop. This quote is definitely on my vision board. It’s so easy to put things off in order to wait for inspiration to strike or the “perfect time” to start. But here’s the deal, there will rarely (read: never) be a perfect time. So listen to King. Get up and goto work. That’s how you get it done. Another reminder for my fellow perfectionists out there. Many of us perfectionists delay starting because we fear we won’t get it “perfect” right away. And if it’s not perfect right away then <gasp> what might people think? As I need to remind myself nearly every day: people will think nothing. Quite frankly, people won’t care. You know what people do care about, however? They care about seeing you work toward your goals day after day. They care about seeing your put yourself out there and doing your best. Because that is admirable. That’s something to care about. While it’s good to keep the end goal in sight, make sure you’re enjoying the process along the way. While this might seem like a no brainer statement, I can’t stress its importance enough. If you want to get in shape, but you hate every minute that you spend at the gym, you’re going to have a very hard time reaching that end goal. By finding another activity that you do enjoy, however, you make the process of exercise enjoyable. When you enjoy the process, you have a much easier time forming good habits and sticking with it. This is a great reminder to – when possible – go that extra mile. While most people will meet the minimum requirements, very few take those additional steps. By doing so yourself, you stand apart from the rest. They say it takes 10,000 hours to master a skill. If you’re frustrated after working toward your goal for a few months, don’t be so hard on yourself. Each failed attempt offers room for growth. So take the opportunity, discover the lessons within each failure, and try again. Build up those 10,000 hours. You’ll get there. Don’t give up. Well here’s the deal – those three years are going to pass by anyway, right? So why not spend them working toward your dream? Looking for more tips on how to achieve your career goals? Check out my post How to Set and Reach Your Career Goals. Then, download my free career goals workbook here! The mind is a truly powerful thing. So if you’ve convinced yourself that you can’t accomplish something, then you’re probably right. Remember, however, that this type of failure is not an indication of your ability. Rather, it reveals your low level of confidence. So it’s time to shift your mindset and start telling yourself you can. Because guess what? You can. Take some time to reflect upon your ideal life. Think about what makes you excited to get up in the morning, and then set your priorities so they foster that passion. While reaching this goal may take some time, that’s okay! As Earl Nightingale reminds us above, time will pass regardless of whether you’re working toward your goal or not. So get inspired, and then get to work! Do any of these quotations speak to you? Great! Then download my free 30 page booklet; each beautiful page contains one individual quote. Print out your favorites and hang them around your home, office, or wherever you need a boost of motivation. Did any of these quotations stand out to you? 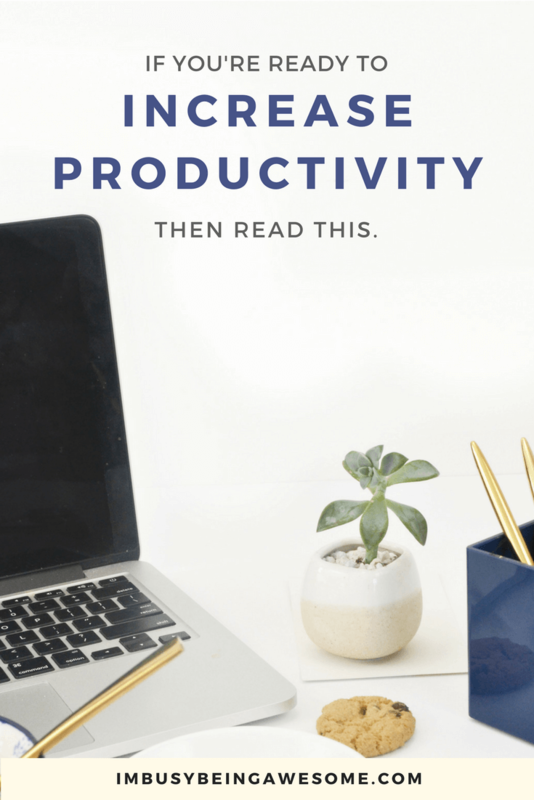 Do you have a favorite productivity quote that I didn’t include? Do you have a vision board? Let me know below! That Warren Buffet quote is key. Definitely something to keep in mind when things feel discouraging. Great quotes! I agree that busy does not always equal productive. “SOMEONE’S SITTING IN THE SHADE TODAY BECAUSE SOMEONE PLANTED A TREE A LONG TIME AGO.” This quote is one I’ve never heard of and is so true! The things we do today are setting the stage and creating the platform for others to receive from in many unique ways later in the future. Our gifts are beyond where we are now! I absolutely love this blog post idea. I would never think to put all these quotes together to form a post, but I loved reading through it!! These are fabulous! I love every single one. Many would make great quotes for my felt board! I love the one about scheduling your priorities! I had to really take a look at the way I spent my time a few months ago. I was doing so much work but not getting anything done! Making time for what’s important completely changed my productivity level. I love all of these! Just what I needed to hear this Tuesday. I love quotes too! There is just something about them that encourages you to get back to work or keep going. I’m so glad you found them helpful 🙂 That makes my day! Amazing tips. My favourite is “you may delay, but time will not” – absolutely! Yes, that’s such a powerful one! So many great quotes! I was feeling a little sluggish about things, but this was really inspirational. Thank you for sharing! So many great quotes! I’ve been wanting to put together a vision board, and now I need to do it. These will make a great addition…and provided some great motivation too. I’m so glad to hear it 🙂 I put off making a vision board for a long time. And now that I finally did, I wonder why I waited so long. Ha! This was just the little pep talk I needed! I love that Stephen King one. Great list of quotes! I love changing the words and pics on my inspiration boards too. Feels like it’s a boost of energy! I love Lincoln’s quote: “DISCIPLINE IS CHOOSING BETWEEN WHAT YOU WANT NOW AND WHAT YOU WANT MOST.” I’m not the most patient person, but reminding myself to keep my eye on the prize helps a lot!